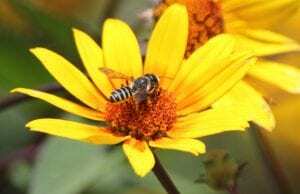 OSU Pollinator Summit 3/28 in Columbus: Register Now! What threats do bees face, and what steps can we take to protect them? Gather in Columbus with bee biologists, conservation experts, educators, gardeners and citizen scientists to learn and network. $50 registration fee includes lunch, refreshments and handouts. More Details and Register Here! 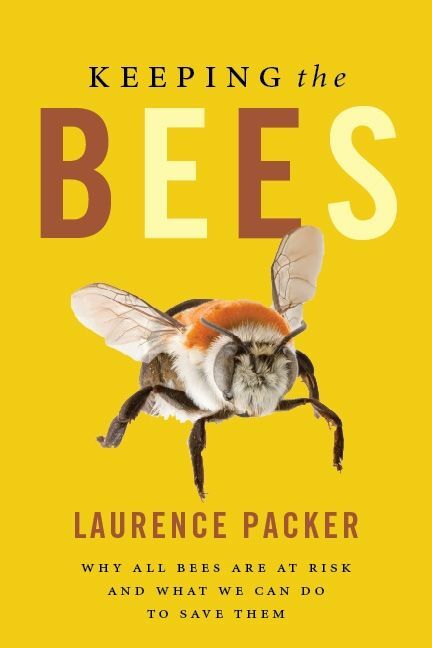 Keeping the Bees; Why All Bees Are At Risk And What We Can Do To Save Them and co-author of Bees: An Up-close Look At Pollinators Around The World. What threats do bees face, and what steps can we take to protect them? Join bee biologists, conservation experts, educators and citizen scientists for this daylong workshop on bee biology and conservation. This workshop will take place on the OSU Columbus campus on March 28th, 2019. Mark your calendar for this exciting workshop! Registration opens in February. If this message was forwarded to you, join our mailing list to receive registration details when the site opens. I hope to see you in Columbus on March 28th! $25, payable at the door. 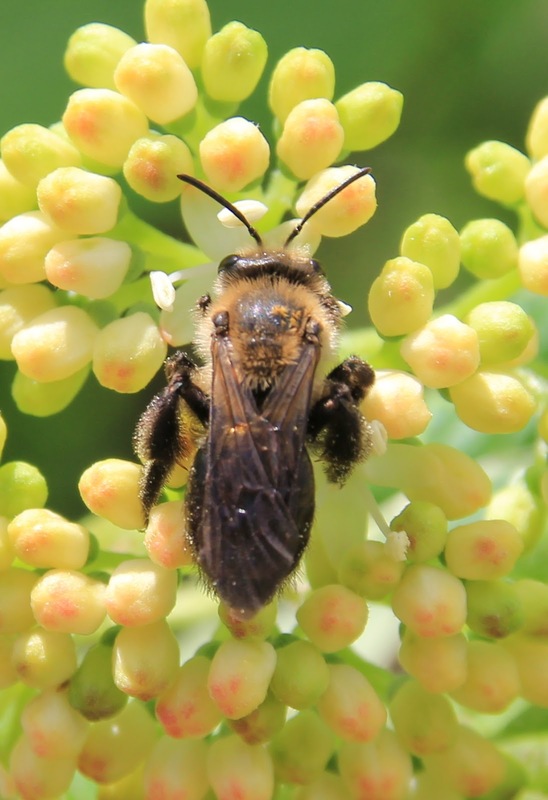 Join fellow bee and pollinator enthusiasts for this daylong training focusing on pollination, bee biology, native bee identification, and habitat enhancement — with a focus on bumble bees. 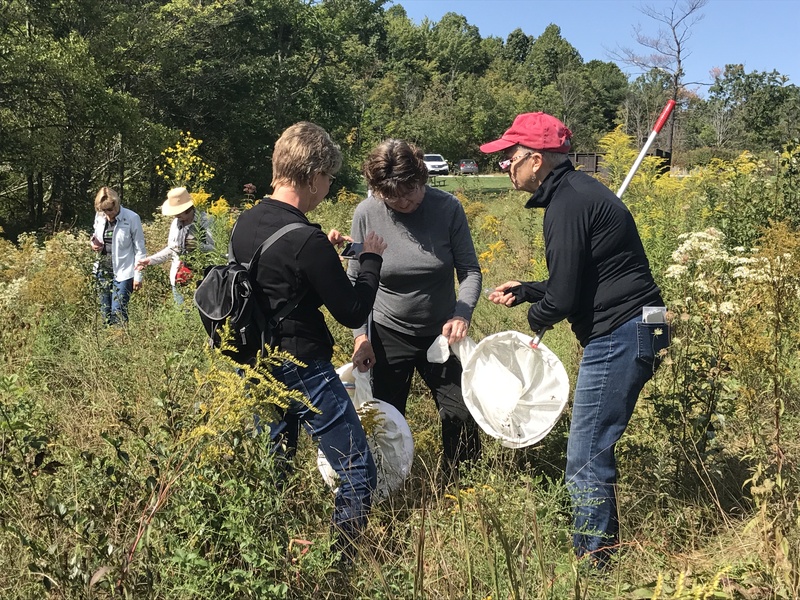 Participants will learn to identify common bees using pinned samples and microscopes, and will leave with practical ideas to increase pollinator habitat. Program sponsored by The Ohio State University Bee Lab. Ohio Pollinator Advocates are trained volunteers who help to spread the word about the importance of pollinators. Session taught by Denise Ellsworth, OSU Entomology/Extension. Contact Denise (ellsworth.2@osu.edu) with any questions. 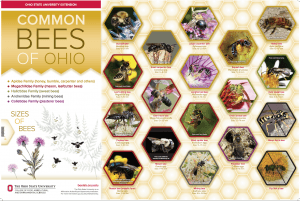 This Common Bees of Ohio poster is available as a free PDF download. The accompanying Common Bees of Ohio bee card (below) is also available as a free PDF download. Laminated cards can also be ordered for a fee. Thanks for helping to spread the word about pollinators! Join us on the OSU Wooster campus for the fourth annual Cleveland Pollinator and Native Plant Symposium. This event brings together well-known experts for a lively exchange of information and expertise. They will share the most up-to-date information on pollinators, native plants, pesticide usage and best practices in creating ecologically sound habitats. This educational and exhilarating symposium will energize your approach to gardening! Learn how you can make a positive difference in your community and world. 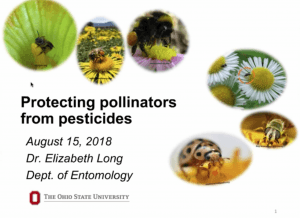 In this webinar, Elizabeth Long provides a brief overview of the factors that influence pesticide exposure risks for beneficial insects across the landscape. She summarizes current knowledge of the different routes of pesticide exposure for pollinators, discusses the research methods used to identify these risks, and highlights steps we can take to promote and protect pollinators in our home, urban, and agricultural landscapes. View webinar recording here. New Ohio Pollinator Advocate training dates have been scheduled at Secrest Arboretum in Wooster (August 7 or September 11), The Dawes Arboretum in Newark (August 13), and at The Bergamot Center in Dayton (September 13). Ohio Pollinator Advocates are certified, trained volunteers who spread the word about the importance of pollinators. Advocates complete at least two hours of training in pollination biology, Ohio bee identification, bee biology and habitat enhancement. Once certified, advocates agree to teach two programs to adult and youth audiences to help spread the word about why pollinators matter and how to take action to conserve these important animals. Advocates have access to outreach resources and materials, including PowerPoint programs and identification guides. Learn more here, and register to attend here. Join Denise Ellsworth from the OSU Bee Lab along with fellow bee enthusiasts at one of these Bee Blitz events across Ohio during National Pollinator Week, June 16 – 24. We’ll use nets and vials to catch (and then release) bees in the field and identify common Ohio species. Shorter events are free; longer events require registration and small fee (see below). Smuckers Store, Orville. Meet in parking lot: pollinator plot is south of the lot. Rittman Orchard, Doylestown. Meet at the orchard store entrance. Holden Arboretum, Kirtland. Meet at the visitor center. Come to the pollinator garden throughout this free pollinator festival! Volunteer seed collectors needed in Ohio! Pollinator Partnership (P2) is seeking volunteers to participate in the Ohio portion of their Monarch Wings Across the Eastern Broadleaf Forest project. Volunteers work with seed collection teams to collect seed from 20 targeted monarch host and nectar plant species. P2 and partners will be holding a training in Summit County (Akron area) on Thursday, May 31st from 9:00am-noon. If you are interested in becoming trained and assigned to a collection team, please register today. https://tinyurl.com/OhioTraining Registration is open through Friday May 25th. If you are located within the EBF-CP, but cannot attend the in-person training, and would like to learn about other ways you can get involved with this conservation project, please email Amber Barnes (ab@pollinator.org). Other states also have P2 seed collection projects for those interested outside the buckeye state. Please share this message far and wide. Thanks for helping to spread the word! Join Olivia Carril and Denise Ellsworth at The Arc of Appalachia from June 1 – June 3 for The Bee Course, a workshop on the ecology, natural beauty, identification, and conservation of Ohio’s pollinators. Emphasis will be on enjoying close-up encounters in the classroom and in the field to meet some of Ohio’s 500 species of bees – including the largest bumblebees, the smallest sweat bees, leaf-cutting bees and mason bees. The weekend will include ideas you can apply at home to attract and sustain pollinators in your home and gardens. Olivia Carril is the Author of, the Bees in Your Backyard: A Guide to North America’s Bees and has been studying bees since she was 18 years old. She completed a Masters degree in 2006 at Utah State University, establishing a long term ecological study of the environmental factors influencing bee diversity on the Colorado Plateau. In 2013 she received her PhD from Southern Illinois University Carbondale, studying a specialist bee (Diadasia) and its host flowers (Mallows and Cacti). Denise Ellsworth directs the honey bee and native pollinator education program through the Ohio State University Department of Entomology. In this outreach position, Denise supports and teaches beekeepers, farmers, gardeners and others across the state through a variety of workshops, webinars, written materials and electronic resources.